“[By using] artificial intelligence and algorithms, there is huge room for improvement to a point where as our users swipe more, they see pictures more suitable to their tastes. They can then quickly match and start an engaging conversation,” Wang said. 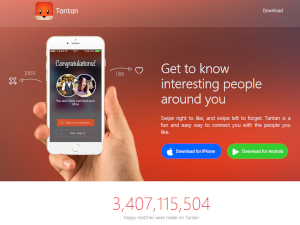 Tantan is already one of the most popular smartphone-only dating apps in China. The app claims more than 90 million registered users and 6 million daily active users. Earlier this year, Chinese social networking app Momo acquired Tantan for approximately 5.3 million newly issued Class A ordinary shares of the company and US$600.9 million in cash. Prior to the acquisition, Tantan raised $120 million from a mix of strategic and financial investors including DST Global, Kleiner Perkins, Genesis Capital, Zhongwei, SAIF China, and video social network YY. The company focused on monetization via membership services, adopting a model similar to Tinder Plus that provides an additional set of features to premium users. Tantan has also expressed interest in expanding beyond China’s borders. Wang indicated that expansions through Asia, primarily in India and Southeast Asia, may be in the works, though no specific targets have been set. Tantan may face competition from smaller rivals with strong regional presence as well as from Tinder, which maintains good usage across Asia, but its position at home is likely to remain robust. “Foreign apps, whether banned or allowed in China, usually do not perform well in the Chinese market as they fail to adapt to the local situation. But we know the market well,” Wang said.